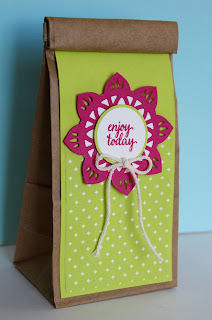 Just Julie B's Stampin' Space: Sweet Cafe Treat Bag for Stamp Class this week! 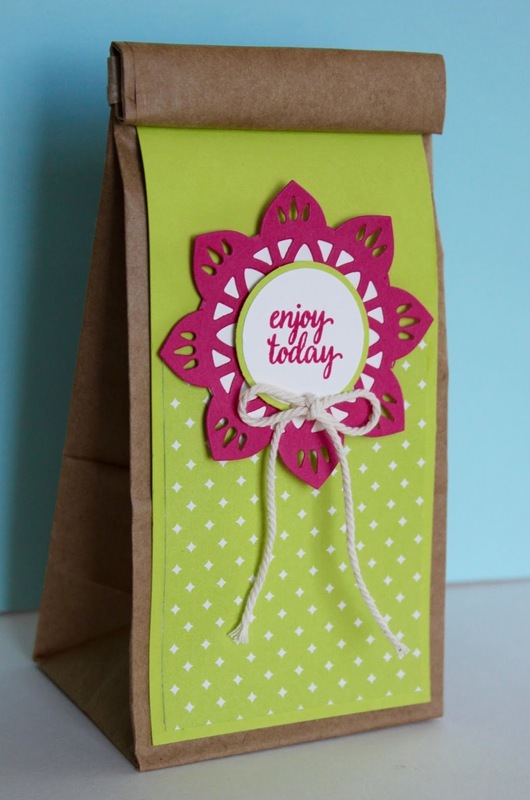 Sweet Cafe Treat Bag for Stamp Class this week! One of the coolest things about the project is the NEW stuff we're using on it! The items are from the Eastern Palace Suite, also a Special pre-buy this month you can see HERE. I have seen so many ways to use this new suite of stamps, thinlits, papers... and there are so many options!! The thinlits especially have sooo many different combinations of possibilities. And when I first saw it, I wasn't so sure, but I LOVE, LOVE, LOVE the New In-Color, Lemon Lime Twist!! It grew on me so fast - the pop of color is just fabulous! And add Melon Mambo with it - :) YES!! It gives a very modern vibe to the Eastern Palace Suite. Too-Cute Tagged Tin for Classes this Week!